There’s a reason why parents get nervous when their teenage kids get their drivers license: road accidents. It doesn’t matter how old you are or how careful you think you are; you can get into an accident, and the risk is even higher if you’re relatively new at driving. There’s no need to live in fear and swear off driving, though; the most important thing is that you know how to handle a car accident if it happens to you. 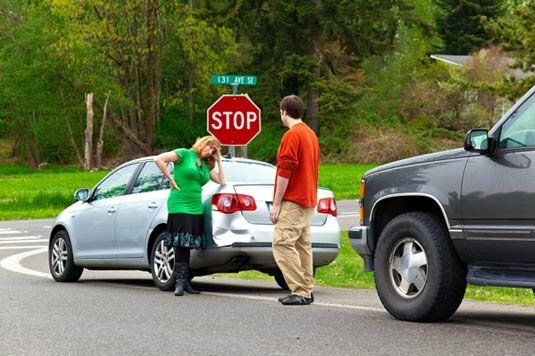 Here are some tips on what to do if you get into an accident. Stay calm. When something like an accident happens, you may feel a rush of emotions and this can distract you from what’s happening. Take a deep breath and count to ten; this will help you keep your head so you can do the things you need to do next. If you’re driving with other people, check and see if they’re OK. Not all injuries are visible, so if anyone (including you) is feeling some dizziness or any sort of pain, call 911 and ask for help. As calm as you can, give the dispatcher your name and contact number, tell them where you are and what happened. Don’t get off the line until help arrives. Depending on the traffic laws when you live, you may be allowed to move the car to the side of the road to get it out of traffic. If not, set up early warning devices around the car to warn other drivers about the accident. Approach the other driver and ask for their license so you can get their license number, name, address and phone number. Make sure that you ask for their insurance information as well. In the event of a minor incident, write down everything you see about the accident, starting with the date, time and weather conditions. Describe in detail all that you observe, such as the vehicles involved, the streets, traffic signs and the directions where each vehicle was coming from. If you have a camera, take photos. If you can, make a drawing of the crash site, precisely making the location of each car and describing where they were coming from. Also, look for any bystanders who witnessed the accident, ask for their names and contact information and their description of the incident. This way, if there are problems on how to settle the issue, their accounts will help clarify what really happened. All of this will help insurance companies and the court find out who was at fault. In a bigger accident, remember to call the police and get them involved. After an accident, people may become overwhelmed with lingering feelings of guilt or fear, especially if it was a major car crash. If you feel any sense of trauma, don’t hesitate to talk to someone about it, preferably a parent or a friend. Releasing your negative feelings can help you deal with the accident better so you can get back to your regular routine much faster.